Sharing your daily Help Scout stats with your manager can help call attention to where you're excelling, where you're improving, and where you might need a little extra help. 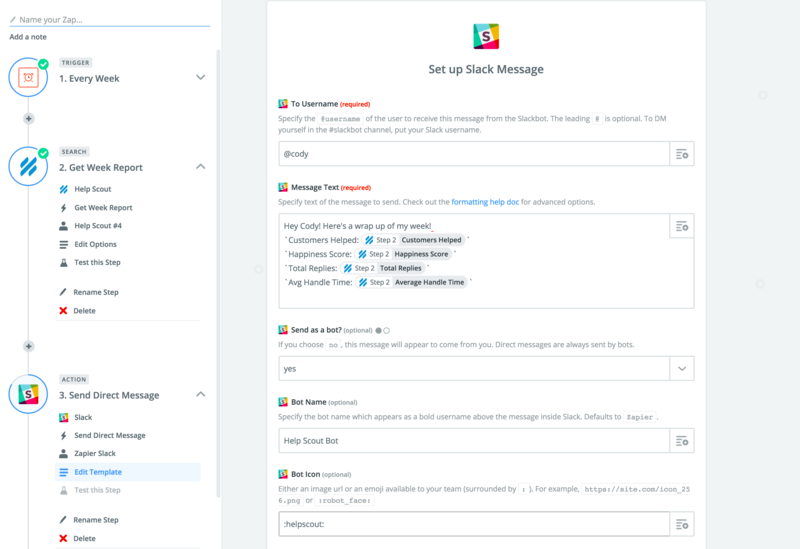 With the boost of a simple automation, you can share a snapshot of your support stats automatically—say, send your boss a weekly email with a roundup of your performance, or post your average Happiness rating to a Slack channel as you close out your day. Here at Zapier, an app automation platform, we're big believers in transparency. We aim to "work in public" so that we can all learn from each other's successes and setbacks. Day to day, that means we default to chatting in public Slack channels instead of direct messages, sharing project plans while they're still a work in progress, and sharing a weekly blog post to the whole company with a wrap up of our week. Here's how you can create a Zap (our lingo for an automation between apps) that will email your boss every Friday at 5pm with a summary of your Help Scout stats from that week. If you don't already have a Zapier account, go ahead and sign up — it's free :) Then, click "Use this Zap" below and follow along. It should take about 5 minutes to set up this automation, no coding skills needed! 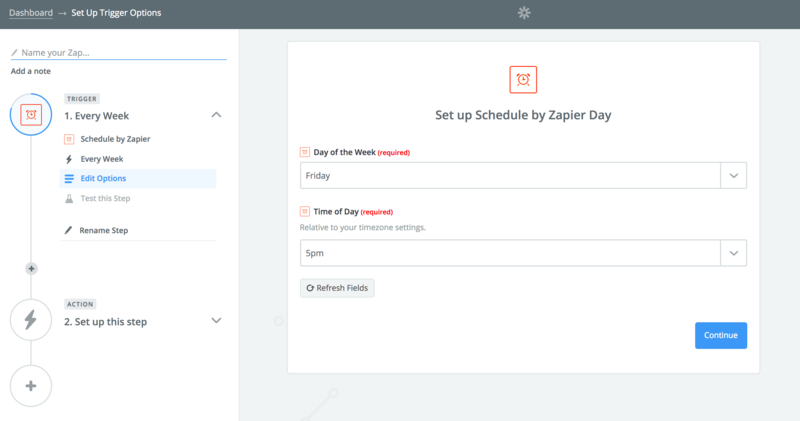 Since we want to send a report every week, our automation will kick off from a built-in Zapier app called Schedule by Zapier. With Schedule, you can choose how often to trigger an automation. We'll choose to run the Zap every Friday at 5pm. Then, we'll add Help Scout to the Zap, telling Zapier to Get Week Report. Enter the email address of the user you want to grab the report of. I want to grab my stats, so I typed in my email. 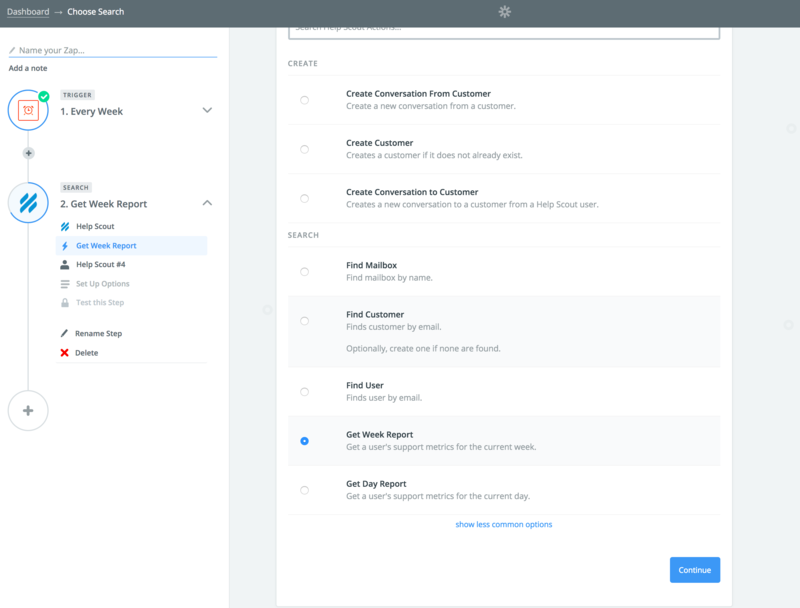 By adding a third step to the automation, we can choose where to send that weekly report. I'm going to share it to my manager via Slack, but you could also email it to your team, log it in a Google Sheet, or send it to any of the other 750+ apps on Zapier's platform. I can customize the info to share in my Slack message. Essentially, I created a blueprint for Zapier to follow every week. Here's what that looks like in Zapier. And here's what that looks like in Slack! Make sure your Zap is turned on, and now every Friday at 5pm, your manager will get an alert with your weekly stats! 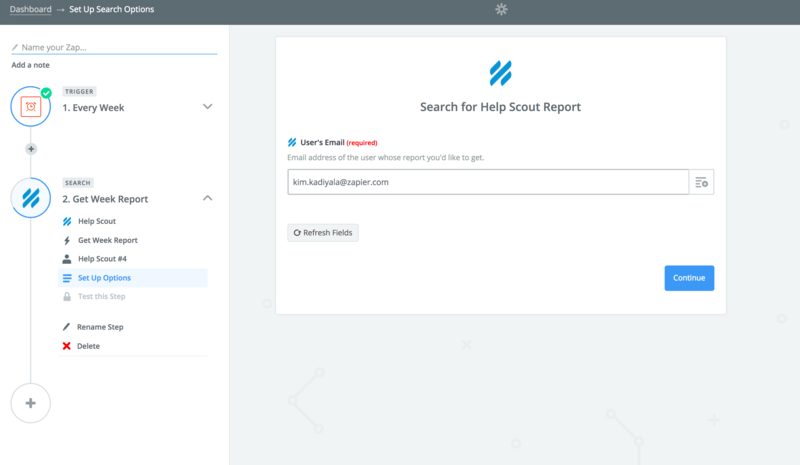 There are many more ways to connect Help Scout and Zapier! Try out some of our favorites or build your own with any of the 1,000 apps Zapier connects.